Captive Radio screens on June 16 at the Sydney Film Festival. You can get tickets here. During four decades of civil conflict in Columbia, guerrillas, paramilitaries and criminal gangs have kidnapped more than 20,000 people. Most hostages are taken for ransom or political bargaining. Sometimes hostages are in captivity for many years. Remarkably, they are allowed to listen to a weekly program known as “The Voices of Kidnapping”. This is a program devoted to messages sent into the jungle to give the captives hope. Captors allow the listening to the program because it is in their interest that the captive remains alive, as it is only while they are alive they are able to bargain with their life. Kidnapping is the way that guerrillas finance themselves. 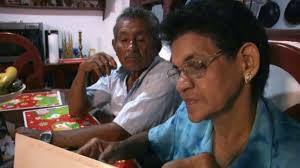 Now two generations of Colombians have lived with the fear of being kidnapped, this has been going on for so long. Captive Radio is a short film (twenty-three minutes) that reveals the trauma the families go through as weekly they send messages to their loved ones who are in the jungle. Skillfully made by Lauren Rosenfeld, it follows the lives of two men, police major, Guillermo Solórzano and the parents of Juan Camilo Mora, who have waited six years for news of their kidnapped son. Wile Guillermo was allowed to send “proof of life” back to his parents in the form of letters and video, Juan’s parents have not heard from him in over six years. Every week they send their messages of hope to their son, silent and lost in the jungles of Colombia. Captive Radio is a short, but important documentary that informs as a good documentary should, but also connects the viewers with the desperation these poor people must feel. It’s very existence is a miracle. Rosenfeld doesn’t get sentimental or dramatic, leaving the events and the grieving families to speak for themselves. Even at twenty-three minutes it is a harrowing experience, but an educative, enthralling one also.